Asarat – from No Hope & Identity to Hope and Success! | Strong Hearts International, Inc.
Asarat – from No Hope & Identity to Hope and Success! Strong Hearts is changing lives from the inside out in Addis Ababa Ethiopia. God has provided the funding to develop a microenterprise program in our community. Through this program, the broken people are given an opportunity to start a new life and to see new hope. They are taught a skills, taught to save money and learning how to develop their own business. I would like you to meet Asarat. When Asarat came to us he had no place to live and was earning less than 2.00 USD per day cleaning the streets. At Strong Hearts we were able to let him live at the school after school was over each day. 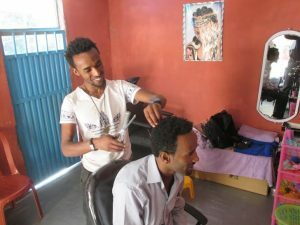 We were able to him in our Hair Styling School and for a year he learned a new trade, learned how to save. 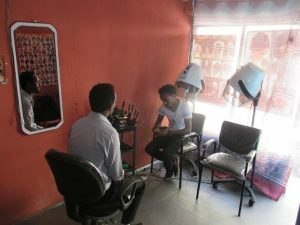 Recently he graduated and with 2 friends they opened their own Beauty Salon business, which is doing very well. Now Asarat sees a future. His earning is not anymore 2.00USD Per day, He is Not only a future as a businessperson but a future as a child of God. Over time as the business grows he plans to open more shops. I asked Asarat what your donations meant to him since it was through your generosity that the program is able to continue. He said that before this he had no hope and no identity and no real direction. Now He has a plan for his life and knows God has a plan for his life too.